The typical jovial Sine Die atmosphere of the Maryland General Assembly was subdued on Monday morning as legislators returned for the final day of the legislative session upon news of the passing of Maryland House Speaker Mike Busch (D-District 30A. Busch passed away on Sunday at the University of Maryland Medical Center in Baltimore after a short bout with pneumonia. He was 72. 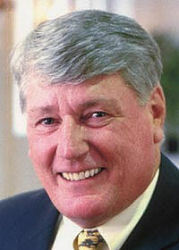 First elected by the voters to the Maryland General Assembly in 1986 and then elected by his colleagues as Speaker of the House of Delegates in 2003, Busch’s sixteen year tenure as Speaker is the longest in Maryland’s history. Known for his commitment to the environment, to social justice, and to those most in need; Busch truly left an indelible mark on Maryland’s history. A mentor and friend to many, Busch’s legacy lies not only in his policy successes but also in his mentorship of fellow lawmakers. Upon news of his passing, many of these lawmakers from throughout the State released statements expressing their condolences on his loss. The work of the General Assembly concludes tonight at midnight. Delegates and Senators will go on with their work assuredly though with thoughts of Speaker Mike Busch in their minds both today and always.